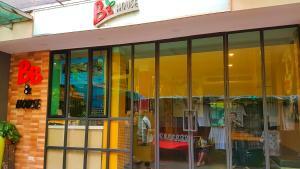 Located in Bangkok, 1.2 km from Khao San Road, BBHouse Phra Athit offers a terrace. The property is set 1.7 km from Temple of the Emerald Buddha and 2.1 km from Grand Palace. Free WiFi is available and Temple of the Golden Mount is 2.5 km away. All units in the guest house are fitted with a TV. Every room comes with a private bathroom with a shower. Guest rooms feature a wardrobe. Speaking English and Thai at the 24-hour front desk, staff are willing to help at any time of the day. Wat Pho is 2.9 km from BBHouse Phra Athit. The nearest airport is Don Mueang International Airport, 28 km from the accommodation. Rate: THB 580.00; select dates below to get current rates. Rate: THB 450.00 ... THB 580.00; select dates below to get current rates.